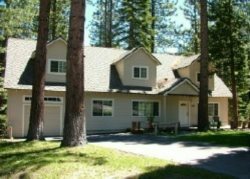 A popular Al Tahoe Chalet with open beam ceilings just 2 blocks to the lake/Reagan Beach and 2.5 miles to the casinos or Heavenly Mountain Resort. Plenty of room for 2 families with 3 bedrooms, 2 baths plus a large sleeping loft. Sleeps 10 with 3 kings and 4 twins. Fully equipped kitchen, linens provided, TV, VCR, stereo, woodstove, wireless internet access, washer and dryer, charcoal BBQ. Pets allowed, no smoking.